I remember one Christmas when a vendor sent us a gift basket with an assortment of chocolates, candied popcorn, and mixed nuts. There were eleven of us in the design group, but it only took two of us, Sad Juggler and myself, to pick out all the cashews from the jar of nuts. Everyone else was pissed. Instead of letting some vendor’s gift/bribe tear the office apart, why not just get a whole jar of cashews? 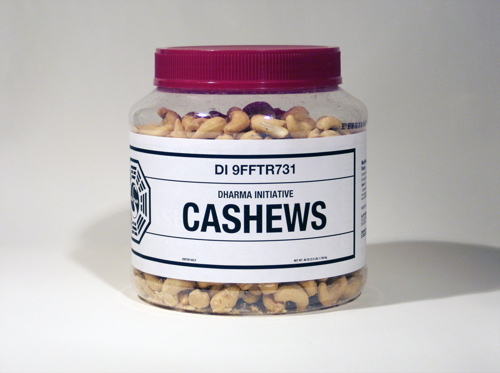 And, while we’re at it, why not a whole jar of DHARMA Initiative Cashews? As usual, download the PDF, print it out (onto legal-size stock), and with the help of scissors, spit, and glue, affix to your 40-ounce jar of Kirkland cashews. Now you can snack away happily while the Oceanic 815 survivors battle it out with the home team Others. Bon appétit! This entry was posted on Thursday, May 17th, 2007 at 3:35 pm	and is filed under Film/Video, Food, Graphic Design. You can follow any responses to this entry through the RSS 2.0 feed. Responses are currently closed, but you can trackback from your own site.